If you are throwing an elegant party for your little princess, you can't pass up our Princess Party Tableware! You can browse and sort all of our princess tableware here or use the search feature above. Your princess can have her cake and eat it, too! Serve her and her guests birthday cake on our Princess Dessert Plates! 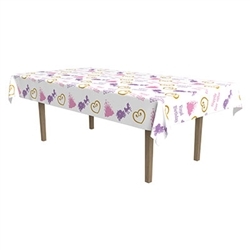 PartyCheap offers solid color table covers in a multitude of colors, so your princess can have the classic pink and purple or she can decorate her party in the official colors of her royal kingdom. She can also use the Princess Plastic Rectangular Tablecover, featuring PartyCheap's version of the royal seal. The symbol of the golden heart is also found on our Princess Luncheon Napkins! You're sure to find whatever you need to decorate for your princess party tables here on partycheap.com! PartyCheap is here to make sure that every aspect of your party has the perfect decorations for your theme. For a princess theme, we have many options to ensure that your dining areas and gift tables are just as beautiful as the little princess for whom the party is given! Our Princess Plastic Rectangular Tablecover is a great way to lay a pretty foundation for your dining area decorations! Our Princess Lunch Plates and Dessert Plates feature a picture of a beautiful castle and the phrase "Happily Ever After". It's a sweet way to wish your little girl well and let her know that you hope all of her own future continues to be joyful! We have Princess Beverage Cups that complement the plates, as well as a Plastic Jeweled Goblet fit for a princess who will one day be queen! PartyCheap also offers Plastic Knight's Cups for any valiant gentlemen or ladies visiting the princess' kingdom. There are many more options featured at partycheap.com, including floral tableware and even some Disney Princess items like these Beverage Napkins! Check out all of PartyCheap's tableware collection for even more inspiration!